I agree that the following probably each deserve their own entry. The reason I am regrouping them is because of their proximity to each other in Sepilok. I would tend to advise to try and do them together. You can get there a number of way, but if you want to take public transport, you should take bus 14 (at least that was the one I took when I went). It will cost you RM5. My day started with the Rainforest Discovery Center, where you get to learn all sorts of things about rainforests and the birds that inhabit them. There was even a treetop walk, which I really enjoyed. This place really allows you to get up close and personal with your surroundings. You could walk there for quite a while. There is a small lake, a garden and the Giant of Sepilok, which is one big tree. Although, with a name like that I had expected even bigger. Titan sized. I suspect these expectations were more a result of my imagination than anything, or of watching too much Lord of the Ring, with its treeants. Since birds are a big part of the experience, I would tend to recommend bringing binoculars. In fact, whether you walk around here or you head out to the river cruise in the jungle, I would go as far as to say that binoculars are a must. I wish I had known this beforehand. For planning purposes, the entry fee for non-Malaysian adults is RM10 and the center is opened from 8:00 AM to 5:00 PM. I watched with amazement these little creatures play in trees. They truly are climbers. They would have put to shame some monkeys! Then, I saw a familiar face in the crowd and had the chance to meet with Siew Te Wong, the world expert on sun bears and the founder of the center. He was walking the grounds like any other employee. From talking to him, I was horrified at learning that these bears are not only endangered because of shrinking habitat, they actually get shot as pests by locals or are raised as pets. I’m not sure if I really should have been surprised, from what I have seen so far, wildlife is not high on the priority list in South East Asia. When I visited the site, I asked if any of the bears would be ready for release in the wild anytime soon. The answer was no. I’m not sure if it’s because of a lack of habitat to release them to or if it’s that the bears are really not ready. A very nasty older American lady happened to be there at the same time as I. She harassed the scientist all because she deemed the bears to be too far for decent pictures. He tried to explain to her that this was done on purpose so that the bears don’t get used to humans and have a better chance of being reintroduced in the wild. The lady just kept going and insisted she should have her money back. I am not sure how he managed to keep his cool, since she kept this up for a good half an hour. These are the types of tourists that make me cringe. Anyway. I spent a great deal of time here before heading on to the orangutans center, in time for the 15:30 feeding. Click here to learn more about these delightfully cute and sadly endangered creatures! 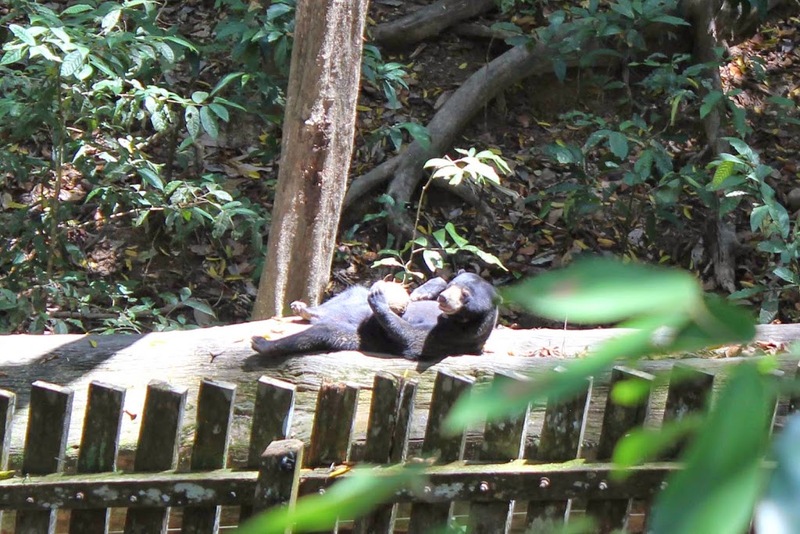 Or even better, visit the Sun Bear Conservation Center’s website. Go ahead, you know you want to click it! We were able to watch an introduction movie, Beartrek, before heading in to the site. You can find the trailer to this movie here and another video explaining in more depth the project, here. For planning purposes, entry fee non-Malaysian adults is RM30 and the center is opened from 9:00 AM to 3:30 PM. There are two feedings, one at 10:00 AM and one at 3:00 PM. Your ticket gives you access to the two feedings. It seems this was my lucky day, the afternoon feeding didn’t have nearly as much tourists as anticipated and the feeding platforms were quite populated by orangutans. 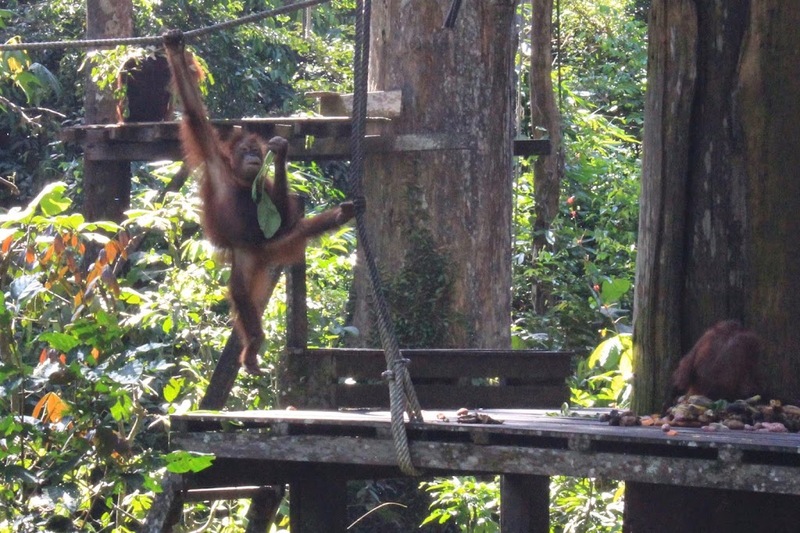 I must have seen a total of 8 orangutans, from the small scraggly one (who eats quite a bit) to the largest one. It was funny, one even tried to get away with three bunches of bananas. Her hands and feet were so full that she barely could maneuver the ropes to get off the platform. It was really nice to be able to get a glimpse of these critically endangered animals. Orangutans are native to Indonesia and Malaysia and belong to the great apes family (along with gorillas, chimpanzees – Jane Goodall anyone? I was fascinated by her work as a kid. – and, yes, humans). 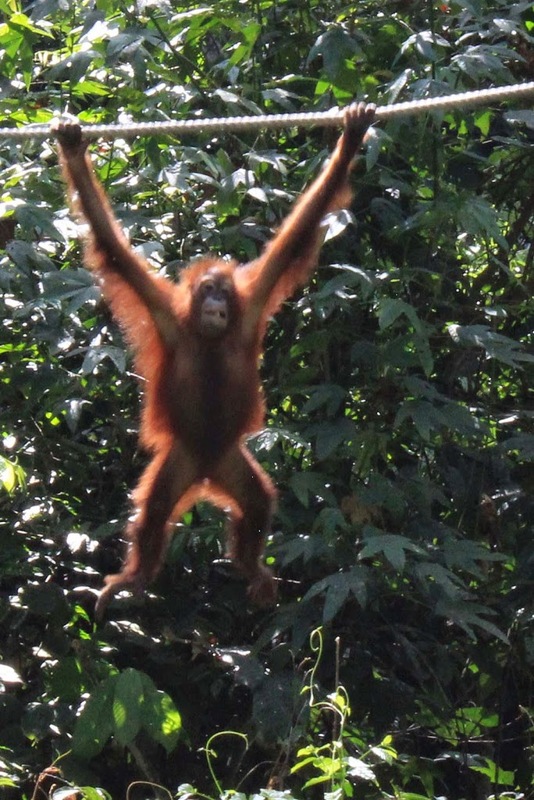 They can now only be found in the rainforests of Sumatra and Borneo. 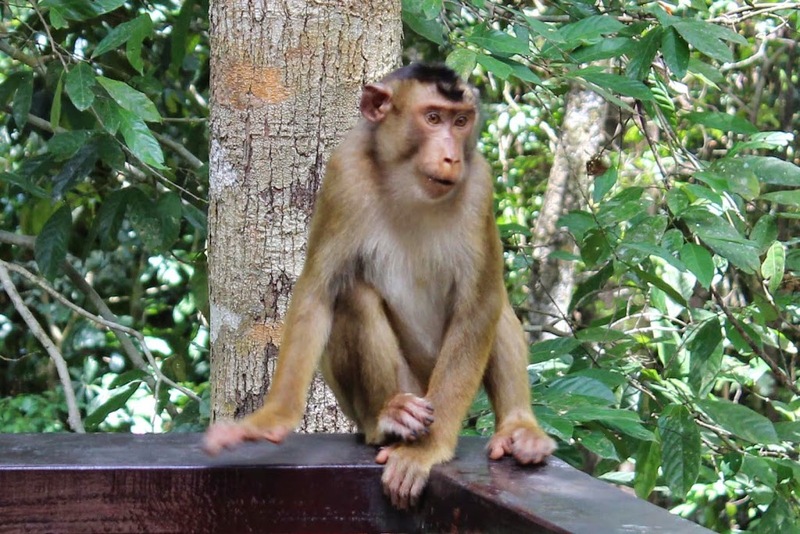 They are considered among the most intelligent of the primates, a characteristic shown by their use of sophisticated tools and their construction of elaborated sleeping nests every nights high in the trees. As you walk the site, if you look up you can see some of the abandoned nests. To learn more about orangutans, visit the Orangutans Foundation International’s website. For planning purposes, entry fee for non-Malaysian adults is RM30 and you have to pay RM10 to be able to use your camera.The center is opened 8:00 AM to 5:00 PM every day.